CLEMSON, S.C. - The Tigers travel for the second weekend in a row, this time to Virginia Tech for a three-game series. 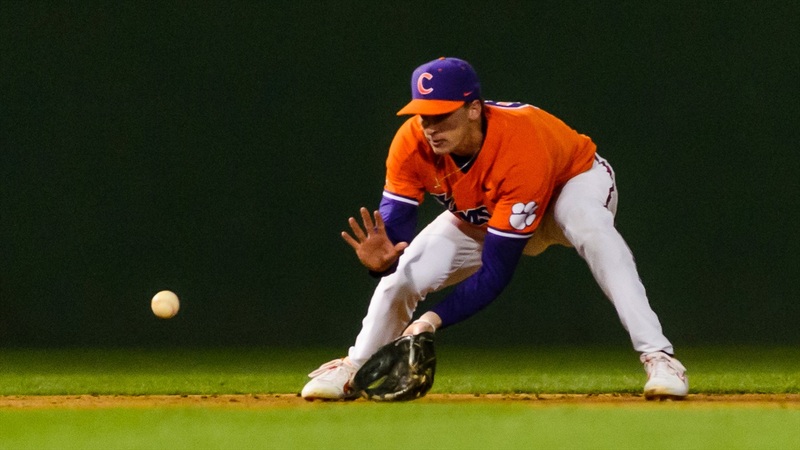 • Clemson defeated Charlotte 8-5 at BB&T Ballpark on Tuesday night. • The Tigers are averaging 6.8 runs per game and hitting .270 with a .380 on-base percentage and 45 steals. • The pitching staff has a 3.29 ERA, .232 opponents’ batting average and 3.14 strikeout-to-walk ratio and Clemson is fielding .967. • Virginia Tech is led by second-year head coach John Szefc. • Liberty defeated the Hokies 6-1 in Blacksburg on Tuesday. They are hitting .269 and have a 3.03 ERA and .976 fielding percentage. • Jack Owens is hitting .345, Kerry Carpenter has six homers and 26 RBIs and Luke Horanski has seven homers and 26 RBIs. • Clemson won two of three games in its last series at Virginia Tech in 2015. • Clemson is 16-2 when outhitting the opponent and 3-4 when getting outhit. • Clemson has several players who have family ties to current and former professional athletes as well as former Tigers. • Grayson Byrd's father, Paul Byrd, was a righthander at Louisiana State and played 14 seasons (1995-02,04-09) in the major leagues. • Logan Davidson's father, Mark Davidson, played at Clemson in 1982 and played six seasons (1986-91) in the majors with the Twins and Astros. • Chad Fairey's uncle, Burke Fairey, played baseball at Clemson (1985-88) and his grandfather, Jim Fairey, played six MLB seasons (1968-73). • Adam Hackenberg's brother, Christian Hackenberg, was a quarterback at Penn State from 2013-15. • Ryne Huggins' father, Mike Huggins, played three seasons (1986,87,89) at Clemson and had a 4-3 record and four saves in 41 relief outings. • Bo Majkowski's father, Don Majkowski, played football at Virginia, then played 10 years (1987-96) in the NFL, totaling 12,700 passing yards. • James Parker's father, Tim Parker, was a pitcher at Clemson in 1987,88,90 and was a third-round draft pick by the Chicago Cubs. • Carson Spiers' cousin, Will Spiers, was a sophomore starting punter on Clemson’s 2018 national championship team. • Carson Spiers' father, Michael Spiers, hit .301 with 16 homers, 110 RBIs and 32 steals in 184 games over four seasons (1988-91) at Clemson. • Carson Spiers' uncle, Bill Spiers, played three seasons (1985-87) at Clemson and played 13 seasons (1989-01) in the major leagues. • Carson Spiers' grandfather, Bud Spiers, hit .254 with seven homers and 44 RBIs in three seasons (1956-58) at Clemson.